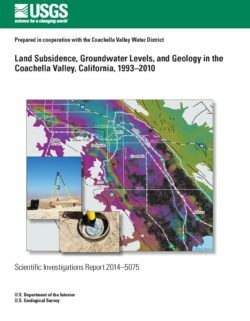 Land subsidence associated with groundwater-level declines has been investigated by the U.S. Geological Survey in the Coachella Valley, California, since 1996. Groundwater has been a major source of agricultural, municipal, and domestic supply in the valley since the early 1920s. Pumping of groundwater resulted in water-level declines as much as 15 meters (50 feet) through the late 1940s. In 1949, the importation of Colorado River water to the southern Coachella Valley began, resulting in a reduction in groundwater pumping and a recovery of water levels during the 1950s through the 1970s. 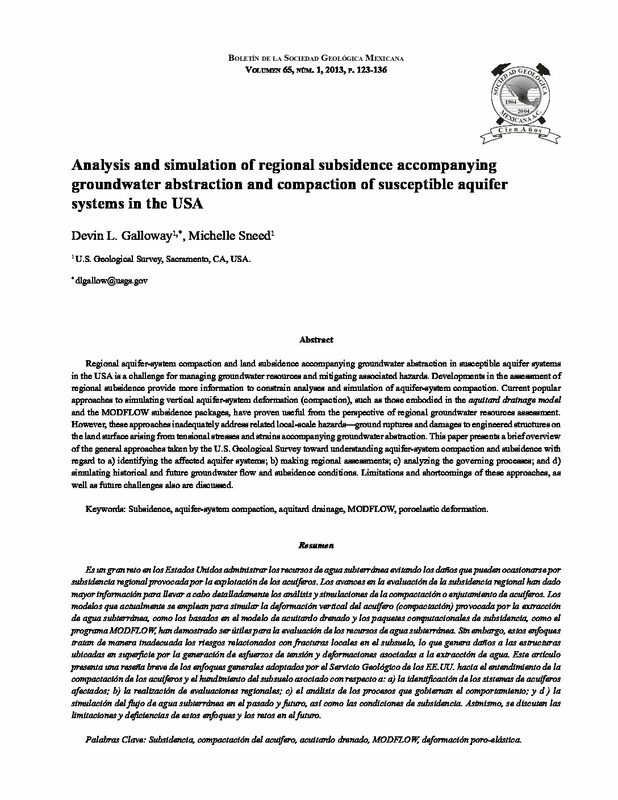 Since the late 1970s, demand for water in the valley has exceeded deliveries of imported surface water, resulting in increased pumping and associated groundwater-level declines and, consequently, an increase in the potential for land subsidence caused by aquifer-system compaction. 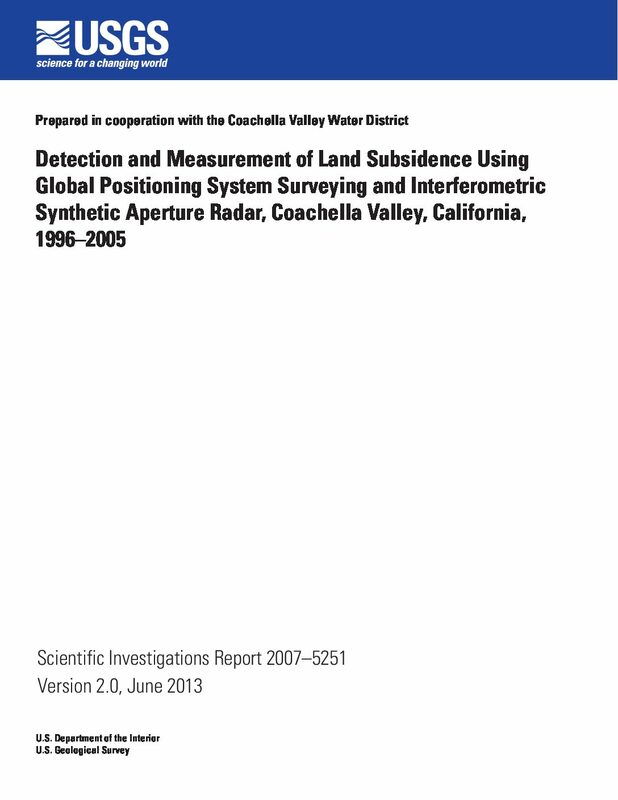 Global Positioning System (GPS) surveying and Interferometric Synthetic Aperture Radar (InSAR) methods were used to determine the location, extent, and magnitude of the vertical land-surface changes in the southern Coachella Valley during 1993–2010. 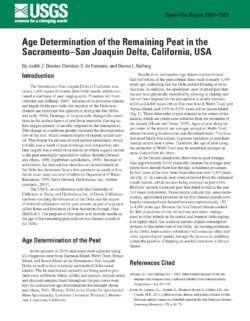 The GPS measurements taken at 11 geodetic monuments in 1996 and in 2010 in the southern Coachella Valley indicated that the elevation of the land surface changed –136 to –23 millimeters (mm) ±54 mm (–0.45 to –0.08 feet (ft) ±0.18 ft) during the 14-year period. Changes at 6 of the 11 monuments exceeded the maximum expected uncertainty of ±54 mm (±0.18 ft) at the 95-percent confidence level, indicating that subsidence occurred at these monuments between June 1996 and August 2010. GPS measurements taken at 17 geodetic monuments in 2005 and 2010 indicated that the elevation of the land surface changed –256 to +16 mm ±28 mm (–0.84 to +0.05 ft ±0.09 ft) during the 5-year period. Changes at 5 of the 17 monuments exceeded the maximum expected uncertainty of ±28 mm (±0.09 ft) at the 95-percent confidence level, indicating that subsidence occurred at these monuments between August 2005 and August 2010. At each of these five monuments, subsidence rates were about the same between 2005 and 2010 as between 2000 and 2005. 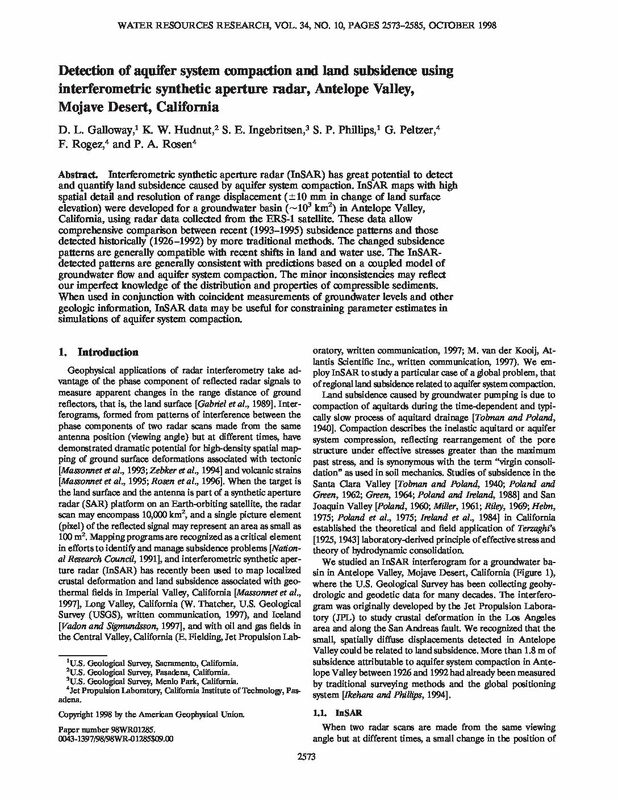 InSAR measurements taken between June 27, 1995, and September 19, 2010, indicated that the land surface subsided from about 220 to 600 mm (0.72 to 1.97 ft) in three areas of the Coachella Valley: near Palm Desert, Indian Wells, and La Quinta. In Palm Desert, the average subsidence rates increased from about 39 millimeters per year (mm/yr), or 0.13 foot per year (ft/yr), during 1995–2000 to about 45 mm/yr (0.15 ft/yr) during 2003–10. In Indian Wells, average subsidence rates for two subsidence maxima were fairly steady at about 34 and 26 mm/yr (0.11 and 0.09 ft/yr) during both periods; for the third maxima, average subsidence rates increased from about 14 to 19 mm/yr (0.05 to 0.06 ft/yr) from the first to the second period. In La Quinta, average subsidence rates for five selected locations ranged from about 17 to 37 mm/yr (0.06 to 0.12 ft/yr) during 1995–2000; three of the locations had similar rates during 2003–mid-2009, while the other two locations had increased subsidence rates. Decreased subsidence rates were calculated throughout the La Quinta subsidence area during mid-2009–10, however, and uplift was observed during 2010 near the southern extent of this area. Water-level measurements taken at wells near the subsiding monuments and in the three subsiding areas shown by InSAR generally indicated that the water levels fluctuated seasonally and declined annually from the early 1990s, or earlier, to 2010; some water levels in 2010 were at the lowest levels in their recorded histories. An exception to annually declining water levels in and near subsiding areas was observed beginning in mid-2009 in the La Quinta subsidence area, where recovering water levels coincided with increased recharge operations at the Thomas E. Levy Recharge Facility; decreased pumpage also could cause groundwater levels to recover. Subsidence concomitant with declining water levels and land-surface uplift concomitant with recovering water levels indicate that aquifer-system compaction could be causing subsidence. 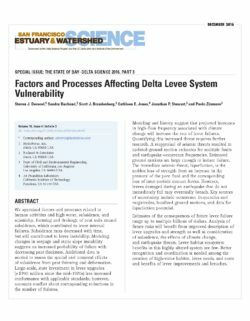 If the stresses imposed by the historically lowest water levels exceeded the preconsolidation stress, the aquifer-system compaction and associated land subsidence could be permanent. 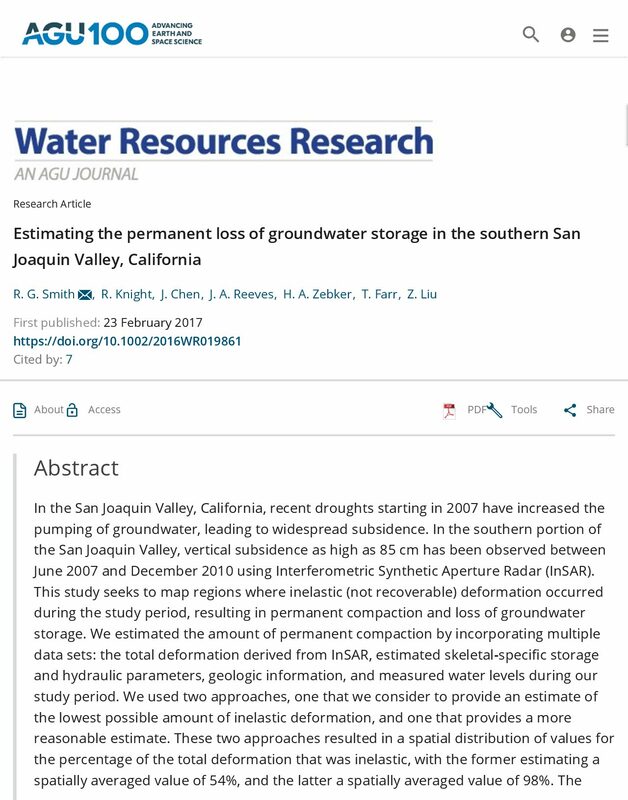 Land subsidence as a result of groundwater overpumping in the San Joaquin Valley, California, is associated with the loss of groundwater storage and aquifer contamination. Although the physical processes governing land subsidence are well understood, building predictive models of subsidence is challenging because so much subsurface information is required to do so accurately. 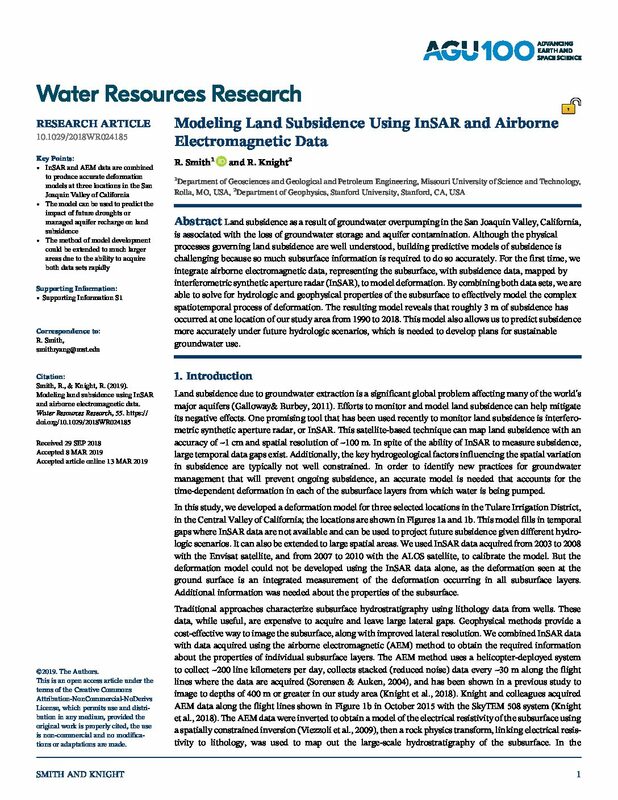 For the first time, we integrate airborne electromagnetic data, representing the subsurface, with subsidence data, mapped by interferometric synthetic aperture radar (InSAR), to model deformation. By combining both data sets, we are able to solve for hydrologic and geophysical properties of the subsurface to effectively model the complex spatiotemporal process of deformation. The resulting model reveals that roughly 3 m of subsidence has occurred at one location of our study area from 1990 to 2018. This model also allows us to predict subsidence more accurately under future hydrologic scenarios, which is needed to develop plans for sustainable groundwater use.